After my angst over potentially switching from the program offered through work to the week-by-week CSA offered by my local farm, we’re now officially beginning week 1 of my 2012 Adventures in CSA. This particular box came from our local farm, at a cost of $22; purchasing in advance for the entire season gets the per-box cost down to $20. The suggests that someone out there thought that around $20/box is a good price that people will consider reasonable for a week’s worth of vegetables. Of course, your mileage may vary on the number of people to be fed by a box; both programs advertise the box as being enough vegetables for 1-2 adults for a week. Hmm. I’d tend to think that 2 adults could whip through those veggies in far less than a week. What primarily holds us back is that the kids won’t eat everything out of the box. The first thing I noticed about this box when the cashier handed it over was that it was startlingly light. I’m used to the later summer and fall boxes, which are weighed down with apples and potatoes. As I told dh when I met him at home with the box: “There’s NO WAY this box will come out to $22 in value.” We will have to see. The quantities are also a bit odd; we got only 1/2lb of carrots (just about three small carrots) and light bunches of other things. I’ll post about the value of this box after I have all of the prices together, probably tomorrow. One important distinction between the two box programs is that the one from our local farm is 90% fulfilled by produce from that very same farm, whereas the other box program (the one through work) is fulfilled by somewhere between 10-20 farms that are all within an extremely close radius of each other. The latter is bound to have more variety than what you’d be able to get from a single farm…but that shouldn’t (and likely won’t) be a deterrent to getting that particular program. 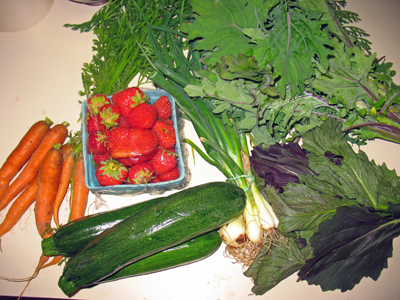 I consider us extremely lucky to live in an area where we can get into not one but TWO different CSAs within our town. It’s extremely unlikely I’d ever do the other CSA in town; that one requires that you help plant and harvest, and I’m willing to bake into the cost of the CSA my never having to pick strawberries ever ever EVER again. (Ow – my back.) So, if you have access toany CSA, it may not be the utopian CSA, but if it has fresh fruit and/or veg and it’s local, then you’re already doing something really wonderful for a local farm and your local economy. Fear not; I haven’t turned into a complete loca-bore. I like to eat oranges all year round, and since I don’t live in Florida or California, you better believe those suckers are shipped in from out of the region. Still, there’s something really wonderful about telling your kids that you have a veggie box in the car and then hearing them explode with joy, clapping and cheering. That’s pretty priceless, to me. Come and link up to this week’s party when you get a chance…http://inherchucks.com/2012/06/20/whats-in-the-box-31/. Looking forward to seeing you there! Yikes! I don’t think I ever posted my pictures of our CSA this week! Must do when I get home….